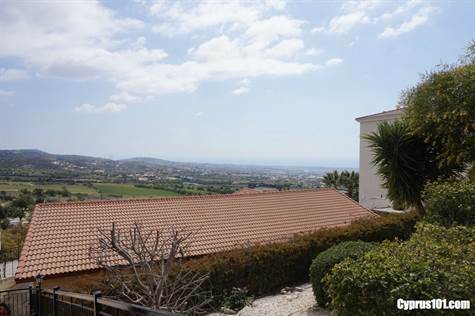 Home »Bungalow»SOLD – Tala Bungalow For Sale in Paphos – Many Extras! SOLD – Tala Bungalow For Sale in Paphos – Many Extras! Tala Bungalow, Paphos – This unique custom-built home is situated in a quiet cul-de-sac in the exclusive location of Melissovonnos in Tala, 10 minutes drive from Paphos Town and the International School of Paphos. Tala is a popular traditional village with a great variety of amenities including local shops, and a lively village square with cafes, bars and restaurants. The property has all the comforts of a permanent residence and includes many extras such as underfloor heating, air conditioning, solar panels, double glazing, fly screens, insulation and much more. The accommodation is particularly spacious and designed around a light and airy central living room and large covered veranda which can be accessed directly from the kitchen, living area and master bedroom. The living room is nicely divided into a comfortable lounge with stone feature shelving unit and formal dining area. An archway leads to a separate fully fitted kitchen and utility room. The kitchen is well equipped with built-in double oven, gas hob, cooker hood, fridge/freezer and dishwasher and in the utility room there are further storage cupboards, washing machine, fridge and freezer. All three bedrooms are double size and located in two separate wings of the property. The master bedroom is particularly spacious and has a modern en-suite with corner bath. Bedroom Two has a stylish en-suite shower room and there is a separate shower room accessed directly from a hallway. Bedroom Three is equally spacious and is currently used as a study/office. The property enjoys the most amazing sea & mountain views which literally take your breath away. Steps lead down from the upper terrace to the swimming pool and beautifully landscaped garden. There is plenty of space for sunbathing, relaxing and enjoying the absolutely stunning views. The outside space of this Tala bungalow is designed with low maintenance in mind and includes a mobile unit ideal for use as maid’s accommodation. The driveway to the parking area features electric gates for easy access. This property certainly has it all – fabulous location and amazing views, spacious well maintained accommodation and good quality finishes. It is perfect as both a permanent residence or holiday retreat, comes fully furnished and has title deeds.